BOSTON (AP) February 7, 2014 — It was April 1956, and the No. 1 song was Elvis Presley's "Heartbreak Hotel." At the Woods Hole Oceanographic Institution on Cape Cod, scientist Dean Bumpus was busy releasing glass bottles in a large stretch of the Atlantic Ocean. Nearly 58 years later, a biologist studying grey seals off Nova Scotia found one of the bottles in a pile of debris on a beach, 300 miles from where it was released. "It was almost like finding treasure in a way," Warren Joyce said Friday. The drift bottle was among thousands dumped in the Atlantic Ocean between 1956 and 1972 as part of Bumpus' study of surface and bottom currents. About 10 percent of the 300,000 bottles have been found over the years. 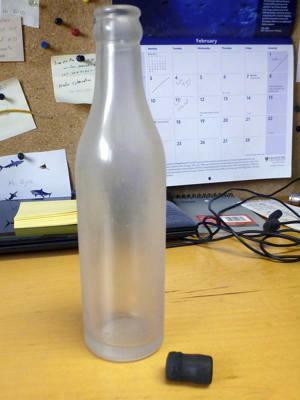 Joyce found the bottle Jan. 20 on Sable Island, about 185 miles southeast of Halifax. He contacted scientists at Woods Hole and dutifully gave them the time and place information Bumpus had asked for in a postcard inside the bottle. His reward will be exactly what Bumpus promised in 1956 to anyone who returned a bottle: a 50-cent piece. "I didn't want the reward, but they said they are sending it to me anyway," Joyce said, chuckling. 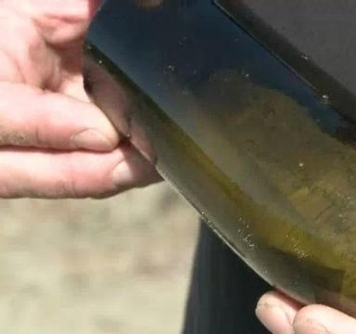 Joyce said the bottle had been sand-blasted over about 75 percent of its surface. He could still read the words, "Break This Bottle," so he pried off the rubber stopper. 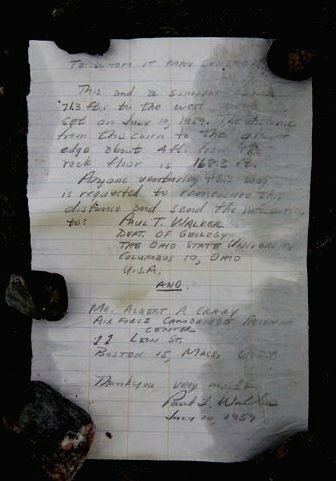 Inside, there was a note from Bumpus explaining that the bottle was among many being released to study the ocean. In those days, there was no other way to study currents, said Steven Jayne, a senior scientist at Woods Hole. "We didn't have satellites to track currents like we do now. So the only thing you could do was to see where something started and where it ended up," he said. "That was a pretty good approach." 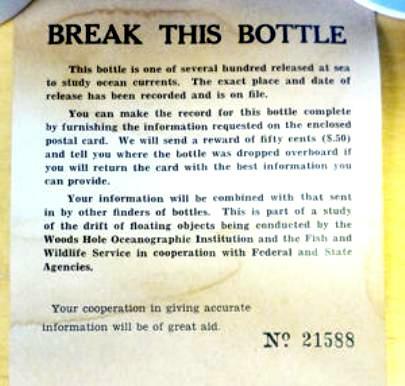 Using the number on the postcard, Woods Hole workers tracked the bottle found by Joyce to a group of 12 released not far off Nova Scotia on April 26, 1956. 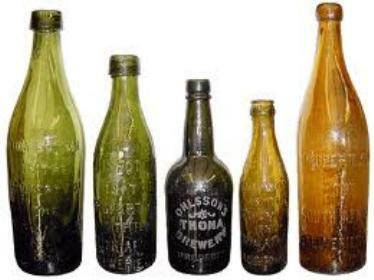 Woods Hole archivist David Sherman said three other bottles from the same batch were found within a few months after they were dropped in the ocean: two in Nova Scotia and a third in Eastham, on Cape Cod. There's no way to tell for sure when the bottle Joyce found washed up on Sable Island, but judging by its sand-worn condition, it may have been there for decades, Sherman said. Bumpus needed thousands upon thousands of empty bottles for his well-intentioned littering of the seas. In September 1959, he solicited colleagues' help, writing in a memo: "All hands are respectfully requested (until further notice) to bring their dead soldiers to the lab and deposit them in the box just inside the gate. Whiskey, rum, beer, wine or champagne bottles will be used to make drift bottles. Any clean bottles — 8 oz. to one quart in size will be gratefully received. Bottoms up!" Bumpus died in 2002. About 270,000 of his bottles remain unaccounted for, Sherman said. "Some of them were probably damaged, some were probably kept as keepsakes, and the rest, who knows? We may find some more in the future," he said. "I think everybody loves to find a message in a bottle." A Canadian man just out for a walk on the beach may have broken a world record without even trying. Steve Thurber, of Courtenay, British Columbia, said he was walking along Schooner's Cove in Tofino when he found an old bottle in the sand, GlobalNews.ca reported. Thurber said he did not want to open or break the bottle, but was able to make out through the glass that there was a note inside and it was dated 1906.